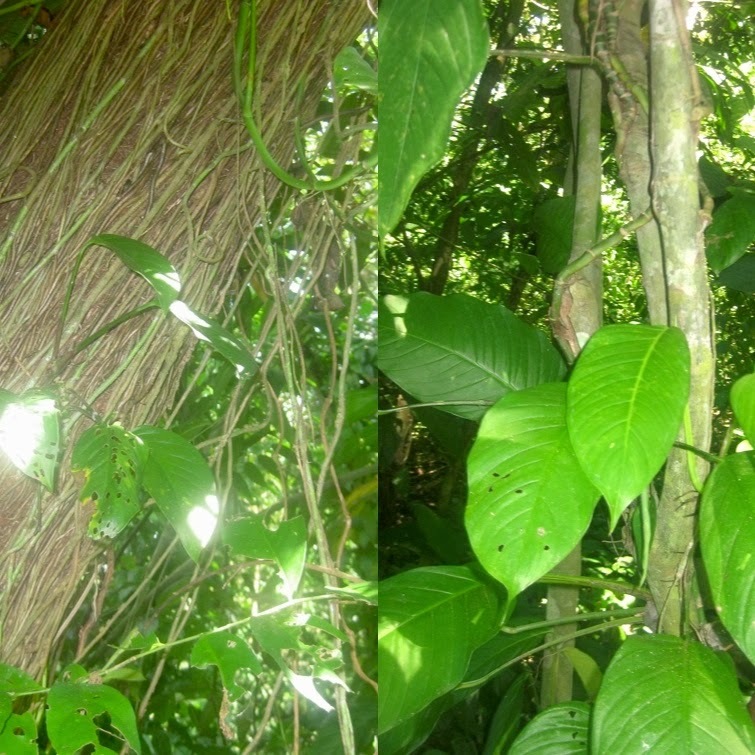 Some ecologists fear that climate change is upsetting the balance between tropical lianas (woody climbers) and trees, to the detriment of the trees. This is perhaps made worse by the otherwise perhaps acceptable thinning of timber trees which lets more light to the openings in the forest canopy. We noticed on our holiday how climbing plants thrive in the clearings created by pathways and roads. I have no idea if there are more climbers now than in the past. 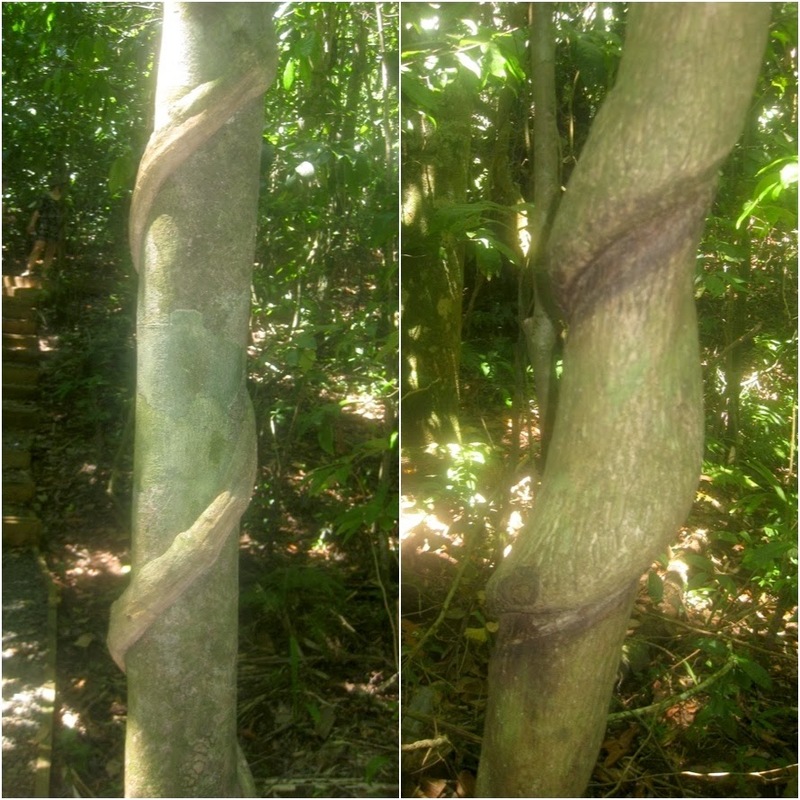 What was clear in wildlife parks such as Hacienda Baru, that when some climbers were cut as part of the land management programme, how much better the trees grew. Of course in natural undisturbed jungle they are an essential part of the ecology. We walked Strangler Walk at Hacienda Baru. It is a feature that highlights the vicious strangler fig. Don’t get me wrong the fig provides marvellous habitat to a wide range of tropical life world wide but not to it’s original host! There are many species of strangling ficus. You may harbour your own; Ficus repens is a common houseplant. The fig’s life history starts with a seed germinating high in the forest canopy in natural mossy crevices. 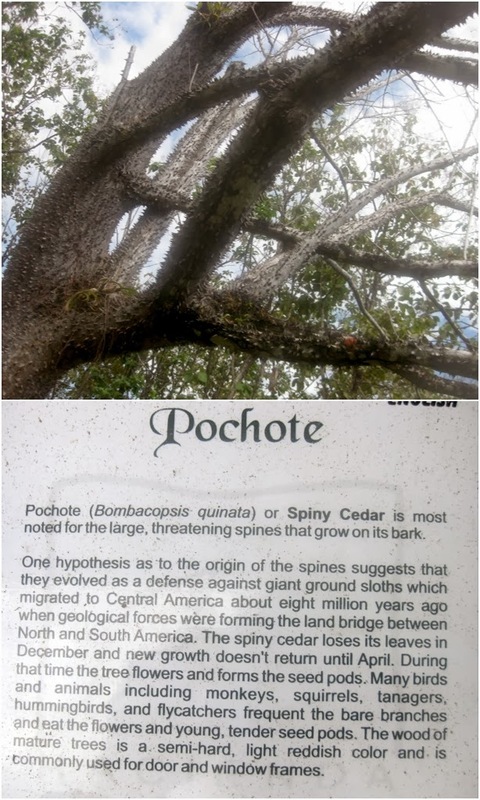 Initially a harmless epiphyte it makes rooting stems growing both higher to carry strong leaves and downwards a very long way to root in the ground. Once generous supplies of soil water and nutrients are available from the ground it starts to take over. It strangles the host’s roots, and grafts itself all over the surface trunk as many rooting aerial shoots twine and join together. 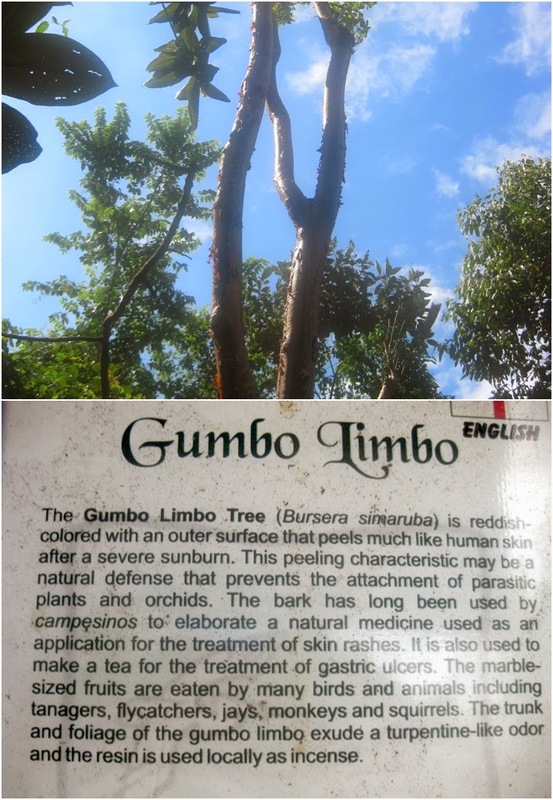 It smothers the canopy of the tree which eventually dies. 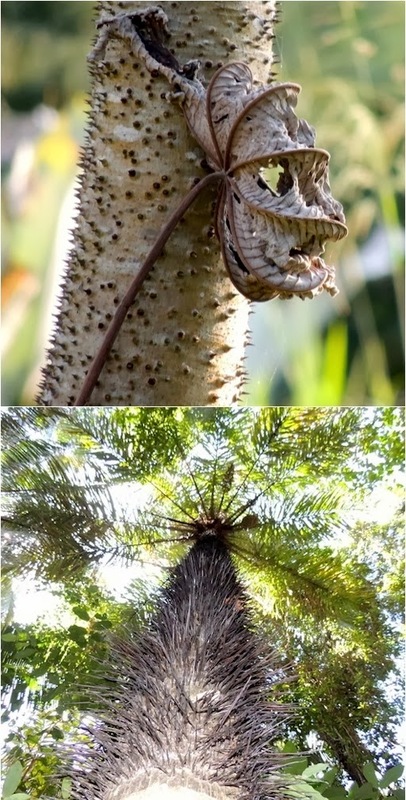 When it has established its place in the jungle (or even in a Southern Californian yard) it strengthens itself further to make a very fine tree. It is often hollow where it has encased the corpse of the original tree! 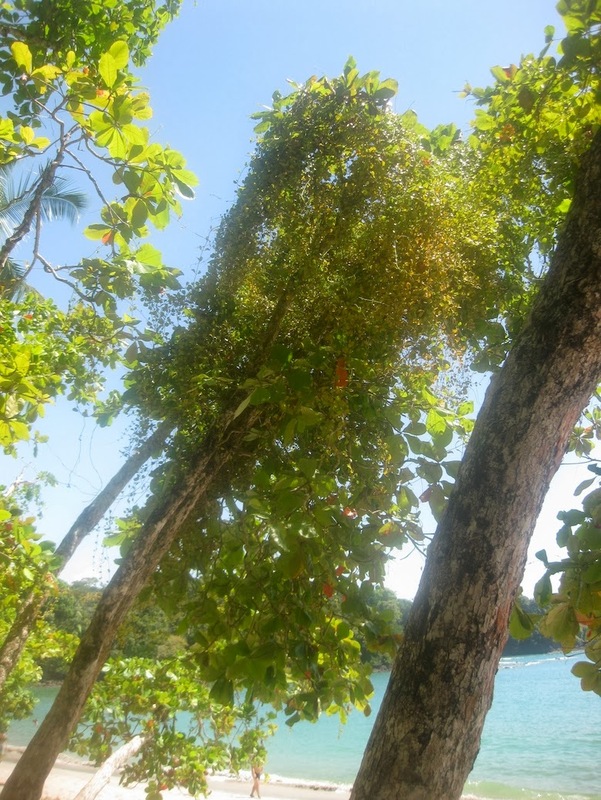 Later in our holiday we walked the margins of a grove of tropical almonds very near to the sea. We saw no evidence of aerial shoots of scandent figs coming down but did see many of them going up from the ground. In a few places we saw free standing fig trees. Perhaps we were looking at the victors of this natural strife. The effect of this unidentified climber reminded me what happens to a trunk at home when a string label is not removed. 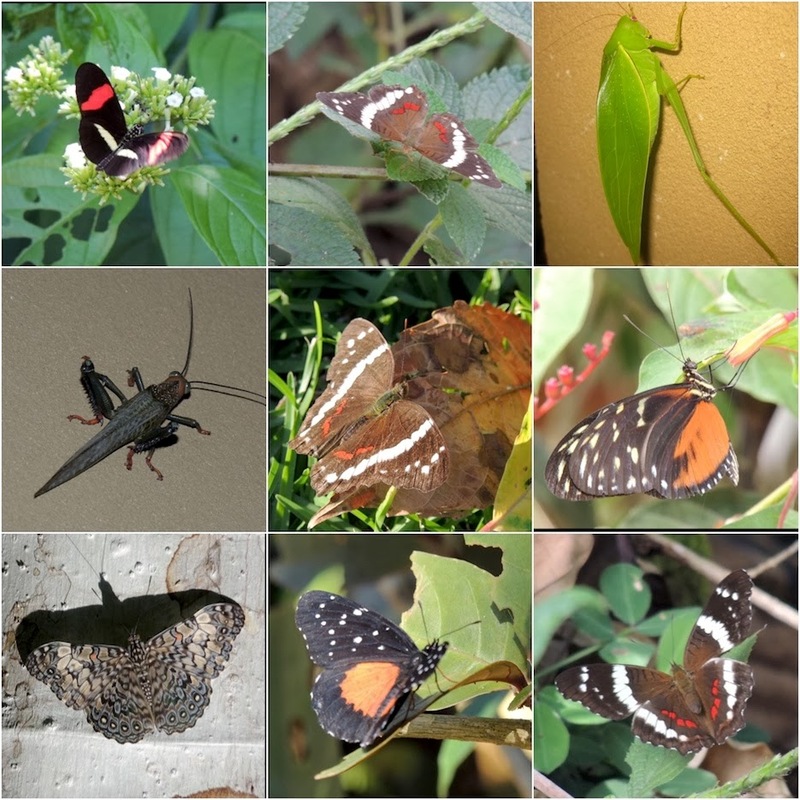 Hemi-parasites can provide a rich ecology and nutritious leaf litter. I wondered about vigorous temperate vines that have a way of taking over at home.The following certainly need to be kept under control! Clematis montana, wisteria, Russian vine, Rosa ‘Kiftsgate' and Vitis vinifera. 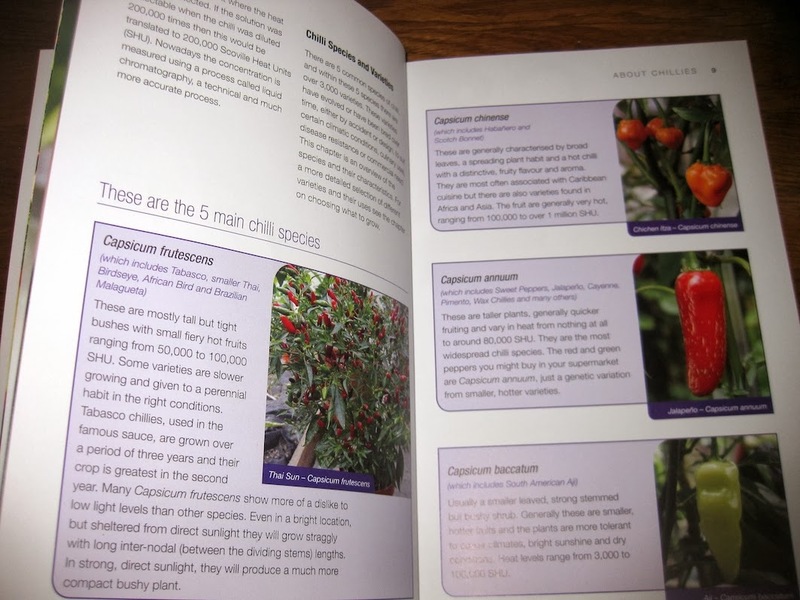 What idiots would go to Costa Rica to see alpine plants? The cloud forest sounded very enticing. I imagined steamy hot tropical jungle. Harry Kennedy had found very skimpy details of a garden that brought together a collection of native flowers. It was in a deep valley at high altitude on the site of a great National Park. Rowena had a sat-nav device on her I-pad. Vague mention was made that the electronic maps might not be very precise over here.The anticipated journey time was a very manageable one hour and twenty minutes. I might mention at this point that Harry was driving a little rugged four by four. We had been told that such a car was necessary merely to access our holiday home. Nobody had mentioned special tyres. What could go wrong? We ascended the winding narrow road for about two hours. We stopped to admire the view and recognised the many temperate flowers. Uncharacteristic Costa Rica flora such as iris, hemerocallis, montbretia, fuchsia and rose! It was getting colder. Another hour and the tree line was starting to open. We had entered the clouds. A bit like a drizzly cold day in Preston, Rowena’s home town. We should have found the left turn by now . Nothing was sign posted. After some bickering we decided we had gone too far and retreated three miles. Up a very unwelcoming bumpy steep gravelled track we found a rather seedy entrance. Except that it wasn’t what we thought! Had we read Spanish we would have found that it lead to a telecommunications unit at the top of Costa Rica at 3400 metres elevation! Another mile up a very rugged track we found what at first sight was what might have been a rocket launch site or a base on the moon. We were debating whether to turn back - the car engine was almost steaming when a far superior mountain vehicle came the other way and stopped. Two amused and bemused beaming telecommunications engineers - pun intended - had not encountered stupid English tourists up there before. We overcame the language barrier to discover that we should go back to the road and continue for ten further miles. Our tribulations were not over. We did find the start of the six kilometre track that leads to Los Quetzales National Park. We stopped at the only roadside cafe - the first signs of habitation for many miles - before embarking on a not quite vertical descent down the almost unmade road. We tried to ask about the garden. Every enquiry was answered with a confident wave saying “that way, down there,”. We were pretty certain they did not understand the question! We started down and it got steeper. There were signs of civilisation. We even had to negotiate a our way around an oncoming tourist bus! By now, even if we got there and found the garden it would be time to be leaving. What we saw of the national park itself was absolutely astounding but we needed a week. Reluctantly we turned back and embarked on a three hour uneventful ride home. Being a bit of a killjoy I often think that holiday experiences are best when you get home! So much to tell and the discomfort forgotten. Poor Harry, what a drive! Fortunately he loves driving and even though some of the roads were dramatic, we had total confidence in his skills. Don’t get me wrong about the roads, the surfaces are good if you do not go up wayward tracks! Road signs are precious and rare. In hindsight we should not have had our adventure at the very beginning of our holiday but waited to learn more before embarking. We should have taken warm clothes. When we at the top of Costa Rica at the telecommunication station we were frustrated and cold. The rocky alpine environment was a fascinating botanical place but we did not have eyes to see it. We should have planned to stay over at one of the hotels in the National Park for a night. We should have realised that if you try to read a sign written in Spanish you can decipher a meaning enough to know that you are not driving into a garden! The next day was spent on the tropical hot beach with the wonderful surf. Much to Brenda’s surprise the highlight of her holiday was playing in the sea! She had never expected to go in the sea ever again but the water was beautifully warm and the breakers were safe! The camera lies and she was not about to be swept away! For someone who purports to hate holidays we are away again! We are ensconced in the foothills of the high central valley. Getting here reminded me why I hate to go away! So much for being an intrepid explorer! 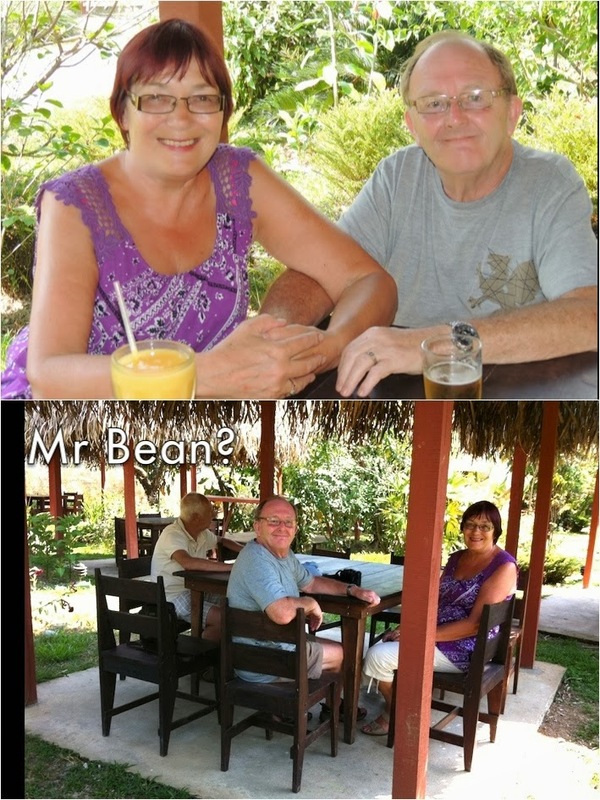 Four years ago Harry and Rowena showed us their pictures of their then recent holiday to Costa Rica. Much to Brenda’s amazement I said I would like to go one day. When Harry rang last year to say they were going again and would we like to come, I said “yes” and Brenda nearly fell off her chair. When in the next sentence she heard me utter the immortal phrase “don’t worry about the cost” she needed reviving. Costa Rica is one of the least ecologically damaged South American countries. The eco-tourist industry is a very significant part of national income, as are pharmaceutical products derived from the rainforest. Much of their natural forest is still intact. Never-the-less we did drive through many miles of palm oil plantation as we drove across the flat plain that leads to the mountains. I remember thinking that when we arrived at the gated community of residences on plots cut out of the jungle that we ourselves were part of the problem. Our residence is surrounded by fairly unspoiled jungle. It is a little incongruous but quite understandable that the roads around the estate are lined with hedges and gardenesque mediterranean plants such as cordylines, dracaenas, codaeums, bananas, strelitzias, cannas, hibiscus, bougainvillea and palms. Our hectare garden is a strimmed levelled plot on the hillside. It is the dry season now and some of the grass is regularly irrigated. The garden is pervaded with exotic tropical plants of the world. Far be it for me to complain about introduced plants corrupting native vegetation. 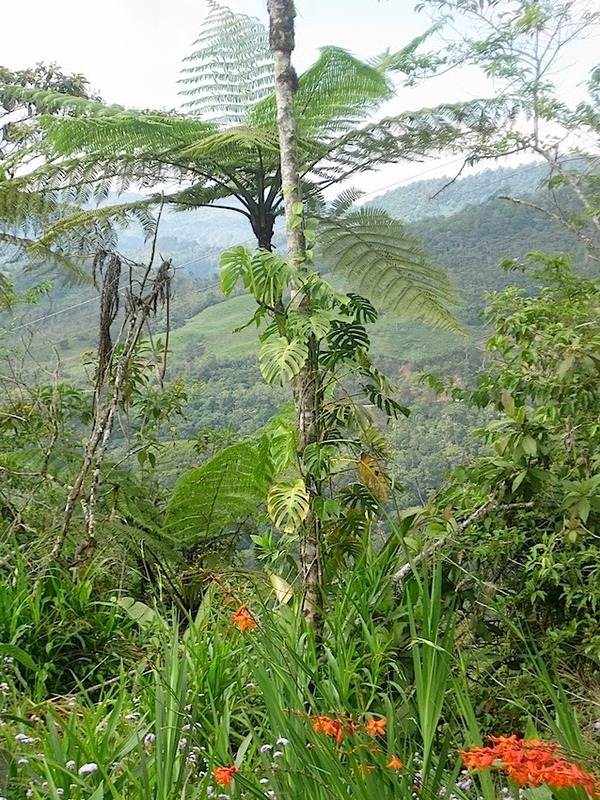 It would be quite hypocritical as I have already prepared a post, soon to be published, that argues the benefits of worldwide plant distribution! Written three weeks ago, I have added some further memories about our holiday experience. I imagined the absence of any Winter would mean that the native shrubby vegetation would be totally evergreen. Most is, but perhaps 10% of the trees are deciduous. As we travelled to our destination I wondered if the leafless trees were dead; part of nature’s natural cycle or worse a result of despoilment. They proved to be native deciduous dry season trees. The Costa Rica dry season is December to April. We noticed many deciduous trees were already sprouting. I read that with climate change the dry season was getting wetter. Was this the reason? More likely, I pondered, is was just like trees at home. Our own native deciduous trees do not wait the end of the Winter before gaining competitive advantage by making new growth. Many of these ‘Tican' deciduous trees were magnificent. We noticed on our return journey that the forest was greener. Once rain forest, the flat land was now fairly uniform but not without interest. On the lighter margins epiphytic ferns and and bromeliads colonised the palm tree bases. Opportunist vegetation grew in a few permitted places. First reaction is to regret the result of mindless international legislation that has created this modern tropical crop. It is a curious hybrid of monotonous farming and forestry with a final dash of industrial processing. But should we despise the jobs provided for seemingly happy workers? It was clear throughout the visit that Costa Ricans were content albeit many were poor. They were welcoming, cheerful friendly people. Most we met were very young. He came once a week to maintain the garden. I imagined our plot was a typical ‘up market’ mechanised American ‘yard’. Many of our neighbours were American and Canadian seasonal holiday migrants escaping the North American Winter. Our gardener discretely spent his first visit strimming a very large area of high banks and lawn. A young man he was armed with a small mini tractor the size of a mower. He worked extremely hard. The second visit precariously perched on the steep banks of the garden he skilfully used a machete to fight back the invading jungle. He did a superb craftsman’s job and the edges were crisper than that done by any machine. Lush vegetation on the bank and the flat surface was strimmed the previous week. The next week our gardener negotiated the high bank to use his machete. On this visit he also irrigated the more prominent parts of the lawn. My previous experiences with high temperature grass has been extremely poor and I have been very disparaging.The grass near the house was neatly clipped and a dark healthy green. After swimming in the pool I walked on the grass rather than the burning concrete. It was like walking on a resilient high quality deep pile carpet. Not all the lawn was high quality. 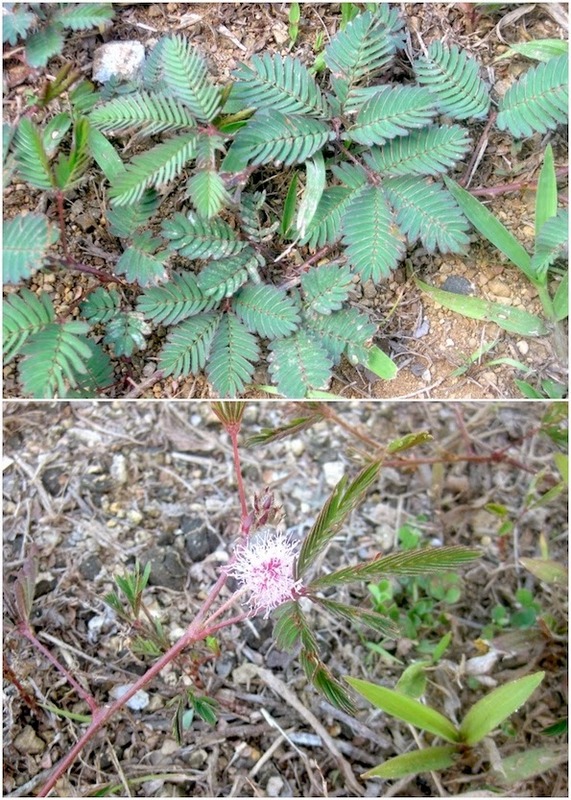 The sensitive plant, Mimosa pudica was one of the weeds. I would have liked to talk to the gardener and compare our experiences. Beneath my sometimes extrovert persona I am quite shy and was reluctant to approach him. I knew their would be a severe language barrier as it proved to be. I plucked up courage and congratulated him on his fine work. Wishing to please, he smiled and nodded in the right places. I shook him by the hand. 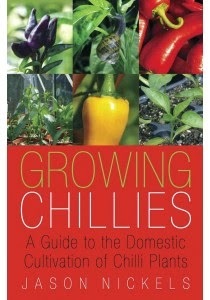 I would have dearly like to discuss matters horticultural. I wonder whether he loved his plants as I do, or just whether it was the only work he could get.